I will (someday) write a more detailed (his)story, but here are the basic facts you should be aware of. I started this project in 2006. The initative was driven by a passion for language learning and the frustration of not finding an adequate online dictionary. The project is focused on sentences and I insist on sentences. The reason is that I felt example sentences was (and still is) a very scarce resource. Please only add complete sentences if you are going to contribute. I was actually "alone" on this project for some time. It was only three years later, in 2009, that other people (all computer science students) started to help me out coding more features. Tatoeba is NOT a commercial project. We're not a company, we're not paid for doing any of this. It is is something that we're working on in our free time. To be honest, we don't exclude the possibility of starting a company someday, but that is if and only if we have an innovative, coherent and ethical business model (yea, good luck). Things like having ads everywhere and drive a lot of traffic, or forcing people to pay to access the data is out of the question. This is the tricky part, and hopefully I can explain it clearly enough for everyone. My name is Trang. Je m'appelle Trang. Me llamo Trang. How are you? Comment vas-tu? ¿Cómo estás? That's a table structure. There are rows and columns: a same row contains sentences with the same meaning, a same column contains sentences with the same language. That's the first approach anyone would have, but that's NOT how the corpus is structured. That's a graph structure. There are nodes and edges: each node represents a sentence, and each edge represent the link between two sentences. When two sentences are linked, they have the same meaning. The way you will contribute would be very different from a structure to another. One important implication is that you can add multiple translation in a same language for a specific sentence. You think there are two ways to translate a sentence and you really can't decide which would be the best? Well, just add both! Some other implications are pointed out below. When you translate a sentence, you are in fact adding a sentence (a node) and adding a link (an edge) between the "original" sentence and your translation. So the only thing you need to care about is that you are adding a proper translation to "main sentence" (the one at the top, written in bigger size). You could add "¿Cómo estás?" (casual) as much as you could add "¿Cómo está usted?" (formal). Or you could add both (because you can add multiple translations in a same language). If you understand French, it doesn't matter if the French sentence is the casual form, you only have to worry about the fact that your translation is a proper translation of the English sentence. A proper translation means that if someone had to translate your contribution back to English, "How are you?" would be a possibility. We are not interested in having sentences that sound like they were written by a robot. We want sentences that really are what a native speaker would say. Translating is a very difficult task, we know it. But if you are translating into your native language, you should always, always re-read your translation as if it was a single sentence, and ask yourself if it is actually something people would say. You can use the comments to indicate a literal translation. If you are not translating into your native language (which you can), you are forgiven for not writing native-like sentences. But in this case, please make sure you find a native speaker to check your sentences so that your possible mistakes get corrected more quickly. The point is to understand that Tatoeba is not only about providing translations, it's also about gathering data about a language. Tatoeba could simply be limited to adding sentences without translating them at all. If we were to extract only the sentences in Italian, we would like that each of them are representative of the Italian language. The sentences are the basic layer. The links between the sentences is another layer. But the corpus should make sense without those links. As I mentionned just above, Tatoeba could simply be limited to adding sentences without translating them at all. Consequently, before you modify a sentence, look at it without paying attention to its translations, and ask yourself "Does this sentence have any spelling or grammar mistake? Does it sound weird?". If the answer is "No", then do NOT edit it, leave it alone! I am explaining this because you may be tempted to edit a sentence so that its meaning matches all the other sentences. It could be because you want to turn a sentence into a more "literal" translation. But this is not a good idea. Obviously, if we don't want you to translate word for word (cf. rule #4), we also don't want you to change a sentence into a word for word translation. => Vamos a la playa. You notice that the Spanish sentence (which says "Let's go to the beach") has nothing to do with the English sentence. Perhaps you are a native Spanish speaker and decide to change the Spanish sentence. In this particular case, it would still be acceptable because the Spanish sentence is not linked to any other sentence. But if someone had translated that Spanish sentence into Italian, "correcting" the Spanish sentence would cause a conflict with the Italian translation. Then there is a problem you may have not thought of: when changing the meaning of a sentence, you are potentially erasing unique vocabulary. What if the Spanish sentence was currently the only one with "playa" in it? So the best way to proceed in this kind of situation is to add a new Spanish translation (Me llamo Trang) and "unlink" the current Spanish translation. NOTE: Not everyone can unlink. Only "trusted users" can. You can post a comment to request a sentence to be unlinked. If the language flag of a sentence is wrong (for instance it was flagged as Chinese when it is in fact Japanese), then of course, you can change it. That's not what I mean by "Do not change the language". What I mean is that you shouldn't replacing a Japanese sentence by a Chinese sentence with the same meaning (and that applies to any language of course). It shouldn't often happen, but if you're in a situation where you want to do that, then don't. The problem is that a sentence can be associated to data that is dependant on its language. For instance comments. People can post comments on sentences, and the comments may be valid only because the sentence was in a certain language. At the moment it is more an issue for Japanese sentences, which are associated to some sort of annotations. These annotations are not displayed because they are not useful for normal users. If you change a Japanese sentence into an English sentence, then the annotations that were associated to it won't make sense anymore. 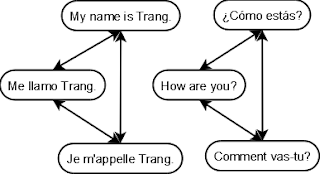 => My name is Trang. And then you can post your comment. Now there is the case where you want to point out that a translation is wrong. Your comment will be related to two sentences, so where should you post it? Well, ideally, for this type of situation, there should be the possibility to comment a link between two sentences. But we don't have that, we can only comment a sentence. So you are free to decide where you want to post your comment. Just remember that it's good as long as your comment is related to the main sentence. We are distributing the corpus under the Creative Commons Attribution (or CC-BY) license. It makes it possible for anyone to re-use this data in any way they want as long as they mention Tatoeba in their work. But providing your work under CC-BY means you also have some responsibilities on what you provide. And you have to know that you cannot legally redistribute data if it was copied from a source that doesn't clearly state that you can do it. Typically, you cannot (legally) copy all the sentences from a textbook and add them into in Tatoeba. Don't worry, you (and we) won't get in jail and be in debt for life if you've added a couple of sentences from a textbook (hopefully...). But the law forbids us to take the work of someone and re-use it without their consent. Producing sentences and translations is work, so be careful where you get the sentences from. Preferably, come up with your own sentences or take them from books that are in the public domain. If you have added or have seen sentences that were copied from a copyrighted material, change a few words so that it won't be exactly the same sentence. Or, go negotiate with the authors and convince them to release their work under the CC-BY license so we can re-use it. I'm not going to argue on whether all of this makes sense or not (obviously I don't believe it does), but it will help us a lot if everyone did the necessary so we don't get sued. Regarding sentences 1 and 2, if you need to indicate that a sentence is a proverb or female speech or whatsoever, then post a comment about it (or tag it, if you are a trusted user), but please do NOT add this information directly in the sentence. There are various reasons why we don't want annotations. They can be a problem for people who are using our data in order to improve a natural language processing system, for instance. Your translation can be retranslated into another language, and it's less easy for people to translate sentences that contain alternatives (like "him/her"). If we want to record audio for the sentence, we will need to choose what exactly to record, and annotations don't help. We know that Tatoeba is not perfect so don't hesitate to tell us what you think is missing (just make sure no one has talked about it on the Wall already). Also tell us if you see any spelling mistake, feel that some explanations are not clear, or encounter bugs. As much as we welcome feedback, we welcome even more INITIATIVE. There are just sooo many things we could do. We can't take care of everything. For instance we are distributing the entire corpus, but many people probably don't need all the sentences in all the languages. You may just want the English-Spanish sentences. Well instead of asking and waiting for us to provide a file with only English-Spanish sentences, you can code a tool (and please, tell us if you do) that will extract only what you want from the our files. That's just one example but if you are a programmer, there could be many things you could do yourself instead of waiting for us to do it. But of course, tell us so we don't start working on something you plan to work on. The code hasn't met my standards of elegance yet... Still too many parts that make me cringe when I look at them. We still don't have a sound methodology and organization in our way of working and I really don't have time to manage more people. For people who didn't know, you can edit your profile by clicking on your username (at the top, in the menu bar). Since Tatoeba involves languages, it can be very useful for other users to know which languages you can speak and how well you can speak them. We don't have a specific "languages" field so you will have to write about it in your profile description (in the section "Something about you"). And tell other users to indicate their languages as well (if they haven't already), especially if they have contributed. The community is very important in a project like Tatoeba, we just can't achieve the ambition without a strong community. But how do you build a strong community? Well, one thing is NOT to make new users feel lost and isolated. Part of this depends on the system. It has to be designed in a way that not only enables but also encourages users to interact with each other. Tatoeba is not great at that, but you have the minimum (private messages, wall, comments). And the other part depends of course on the community itself. There must be an effort from the community to build a stronger community. So if someone is asking a question to which you can answer, don't hesitate to help out. If you notice someone is going something wrong, don't hesitate to tell them the right way to do it. If you notice someone or some people have been contributing significantly, don't hesitate to drop a line (in a private message or on the Wall) to say "congratulations" or "thank you" for their work. More generally speaking, if you have any idea on how to make Tatoeba a more socially pleasant place to be, then go ahead! Last but not least: you love the project, we love the project, we all want this project to become the greatest language tool of all time, so bring more people into this adventure! In the end, anyone who knows how to read and how to write can participate. There's no need to be a polyglot. If you can "just" hunt for mistakes and correct them or point them out, it will be already extremely helpful. The more people, the more mistakes we can take down, the more data we can produce that people can rely on. And everyone can live happily ever after. Just a note, I think "Como usted es" is ungrammatical. "Como esta usted" may be the proper form (I'm not a Spanish expert). Also, you may want to add translations to the sentences. e.g. "Vamos a la playa (Let's go to the beach)" because not everyone understands French, Spanish, and English, heh. I've added a translation for "Vamos a la playa". For the rest, I think people can figure out what it means. Great blog post! I have to tell my father about this website. Great job. It is so beautiful! Style, personality and beautiful ，the theme of our young people! They put clothes and trousers with a great personality! Very interesting site. Maybe it's just me, but I am very confused by how it works. I hope it becomes easier to understand in the future. Wow! I think it is wonderful. Congratulations! Ŭaŭ! Mi opinias ke ĝi estas mirinda. Gratulon! Very nice post about translation and the steps. I will recommend my friends to follow these. Indeed quite long but you were doing great. This blog is a must read for those who have passion for translation like me. Learning a second language is self-fulfillment. Actually we do have a facebook page, but this is not really our main channel of communication. We use this blog and Twitter, mostly. I have not been changing them to sentences, because I think having some noun phrases is fine in tatoeba. (i) it is common to find stand-alone noun phrases in both text and speech. (ii) changing one langauge would get it out of sync with the others. this goes against your policy in (1). Could I get a ruling as to what we should do? either amend the policy (yeah) or decide to change all NPs to sentences (awww). Very nice and easy to follow translation! Your point #4 "Do not translate word for word"
Should be followed by another point. #4a Make sure your translation really means what the original sentence means. Lately, I have seen far too much loose paraphrasing. Wow. I started a 4-language notebook for sentences way back in 1984. I didn't get very far with it. There was no internet back then! It was hard to verify the correctness the alternate-language sentences. Now, here it all is! Awesome. I've been looking for this kind of thing for some time. Thanks! Do you have a place to post possible improvements and suggestions? I know it's a huge project, but I was wondering if others had the same idea as me and if there's a list of what's being worked on and what needs to be worked on. You should change "trusted user" to "advanced contributor" in this article. Maybe it would be excessive, but maybe it could serve as a more economical/democratic way to vet translations, to help indentify vandalism, and to incentivize people to make translations. With something like that, each link would have a public consensus insofar as people participate in the voting. Anyways, just a thought. But in short, some people (including me) are sceptical regarding the efficiency of a voting system. And since the community is rather small, the information would not be so relevant. Maybe with a bigger community it would be worth trying but right now I don't feel it is. Hello! We don't speak with just words, usually. We speak with sentences, and in a sentence, words are united by means of grammars which are different in different languages. That's why, knowing just words is not as important as knowing sentences. Sentences are the basis of speaking, not words, imho.